The Logger feature allows enabled users to add log notes to clips within a project, using an interface designed to reflect existing post production practices. 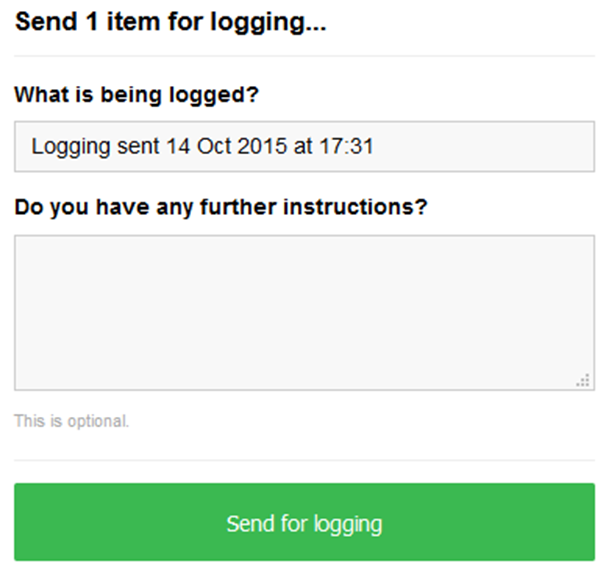 Users with the required permissions, from the projects team, can send clips through to be logged, adding special instructions for the logger.. The tool itself allows for the input of Shot and Sync information against a specific timecode range, using in and out points to designate points of interest in the footage. Once the information has been entered it becomes viewable, printable and searchable. Making it easier to find the proverbial needle in the haystack and the prints can be used as a contextual resource in the edit. To send footage to be logged, choose your clips and select the &apos;Send for logging&apos; icon. This will bring up the logging request window, as shown below, where you can add any specific instructions on what you need the Logger to complete. We recommend changing the &apos;What is being logged&apos; title from the date and time, to something more relevant to you/your team (this will make it easier to find later. Once you click on the green &apos;Send for logging&apos; button, the information will go across to the Logging section of Aframe. If you are a project Administrator or have been granted permissions by an Administrator, you can access the Logging feature two ways. 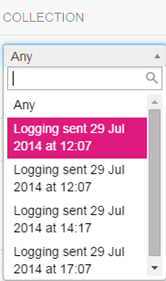 The first is from your menu sidebar (as pictured above), simply click on &apos;Logging&apos;. The second is from your quick access menus in your Dashboard, hover over the project title and the quick access blue menus will appear, now click on &apos;Logger&apos; (pictured below). When you access &apos;Logging&apos; you will presented with a pared down view of the project, where you can only see clips have been sent through to be actioned. You can use the filter options on the right to drill down to something specific you are looking for and you can even filter what has been logged or unlogged. Using the collection drop down menu gives you the dates and times of requests that have been sent through, as pictured below. Selecting one of the requests from the drop down menu will show you the clips logging is required on and any special instructions the requester has added will appear, just below the request date, as indicated below. Now simply click on the Review button and the selected clips will open in the Logging tool, as shown below. The first thing to point out here is the keyboard shortcuts, which are access by clicking on the icon below, located in the bottom left of the screen. This will bring up all of the keyboard shortcuts available within your current browser, giving the logger a quick way to manoeuvre around the tool and make logs. To add a log item, mark an in-point at your chosen timecode by clicking on the . The video will continue to play. ctrl-O) and click ‘Add log entry’ (or type ctrl-Enter). As ever with Aframe, everything is frame accurate, so you can click into the In and Out timecode boxes and use the up and down cursors on your keyboard to find the exact frame you need. Your log item will appear as a ranged marker against the clip in the playlist bar to the right of the player. The blue bar to the left of the playlist (screenshot above) indicates which clip you are currently playing, the purple bar indicates a log marker. Start typing in either the Shot or Sync fields. This will automatically set an in-point for your log item. To add the log item, use the keyboard shortcut ctrl-Shift-Enter. This will author your log item, with the out point set to your current time. The Shot and Sync fields will refresh, with current in point updated to the previous log items out point. You can repeat this process to work your way through an entire clip or selection of clips. 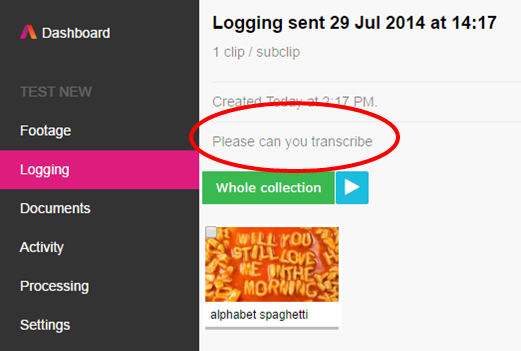 Once you’ve finished logging the clips, you can print all the associated log items for a clip or selection of clips. With the clips open in the player simply click on the icon located in the bottom right, underneath your playlist. Each clip is represented by a file name and timecode range, with any associated log item underneath. Logs can be edited and deleted (only by the original logger) by hovering over the log in the playlist, which will bring up these icons edit and delete. You can give any team member the required permissions to use the Logging feature by adding them to the team and granting the access they need.